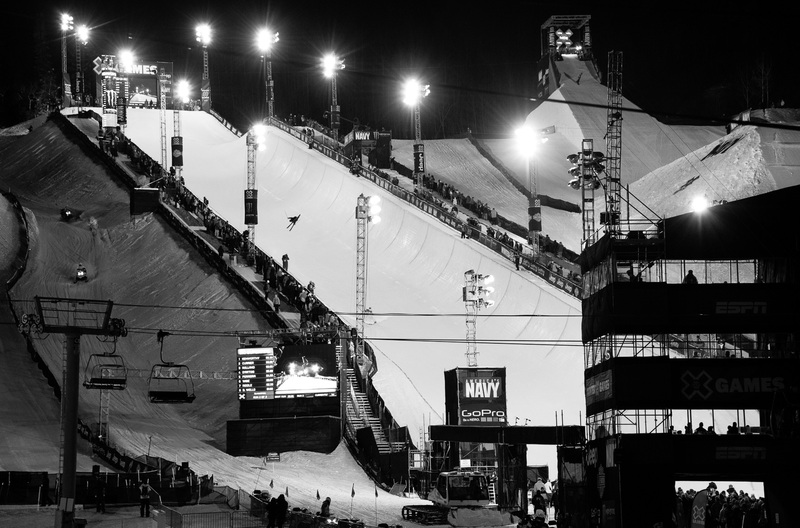 Men's Ski SuperPipe closed down X Games Aspen 2015 after five days of drama-filled, record-setting, high-stakes action. 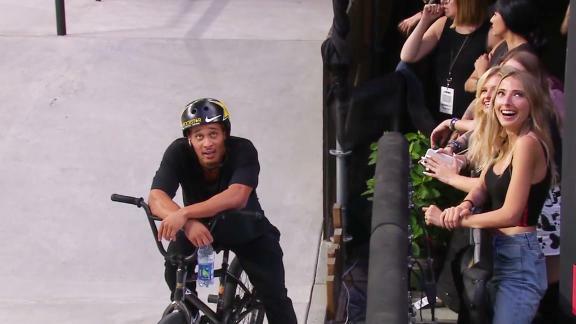 With a new gold medalist in Simon d'Artois and never-been-seen-before tricks, it was a fitting way to cap off the biggest action sports event of the year. See you again next year. 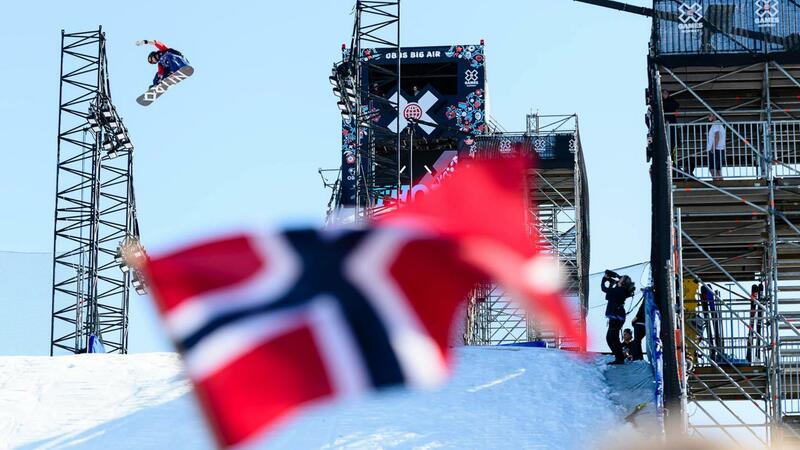 Silje Norendal backed up her X Games Aspen 2014 Slopestyle win with a solid run that included a technical rail section, with tricks like a blunt slide 270 out and 50-50 all the way down the flat-down bar, and a high-level jump line with tricks like a frontside rodeo 720. "Jamie's run was sick," said head judge Tom Zikas, of the call to score Norendal higher than eventual silver medalist Jamie Anderson. "But [the decision] came down to the rail section." With his victory on Sunday, Tucker Hibbert now has eight X Games SnoCross gold medals and owns the longest winning streak in winter X Games history and the second-longest winning streak in XG history, second only to Jamie Bestwick's nine straight BMX Vert gold medals. "This has been an amazing day for us," Hibbert said. "We've got eight in a row." 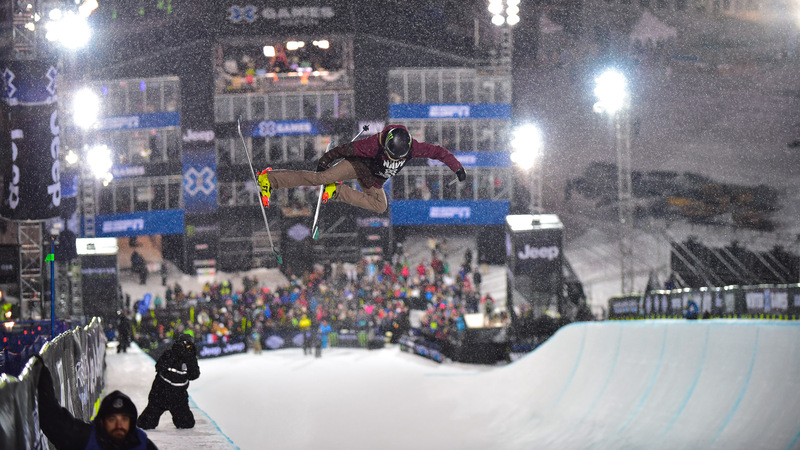 Canadian halfpipe skier Simon d'Artois was a wild-card winner in the men's Ski SuperPipe field, earning his first X Games medal and upsetting three-time defending champ David Wise, who took fourth place. Last year, d'Artois finished 14th at his first XG appearance and he was an alternate for the Canadian Olympic halfpipe team in Sochi. 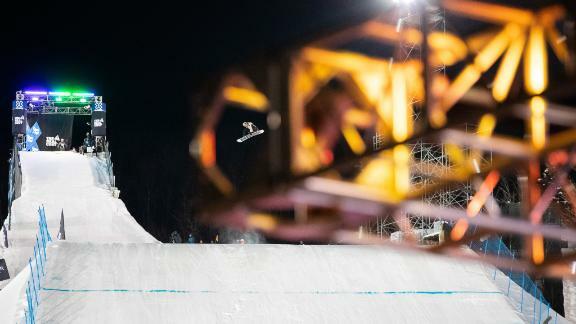 With a Cab 12 into a frontside 1440 to backside triple cork 1440 stomped clean by Stale Sandbech on his first run, the Olympic slopestyle silver medalist seemed to have the first-place spot on lock. 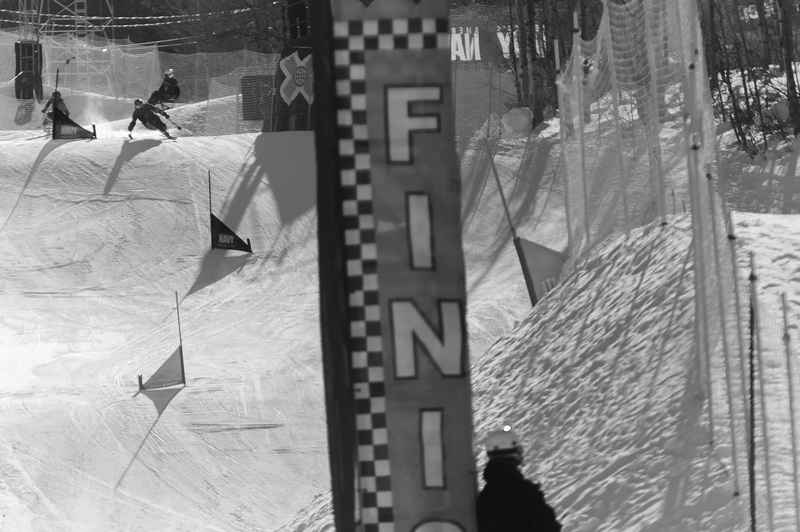 Then Mark McMorris dropped in for his final run and snatched the gold with a more varied and technical rail section. 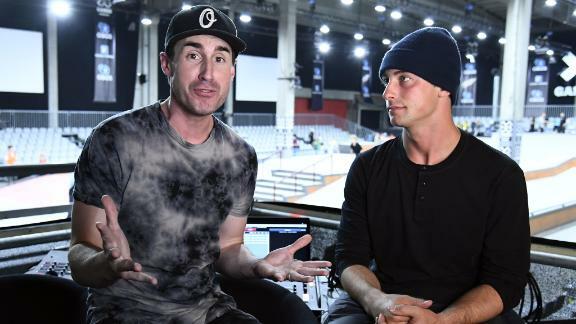 The gold is McMorris' second of X Games Aspen 2015 -- his first coming on Friday night in Big Air -- and this is the second time he's won double Slopestyle/Big Air gold at X.
Twenty-year-old Kody Kamm, who got silver in Sunday's SnoCross finals, says he's not intimidated by the stacked field of competitors at X Games. 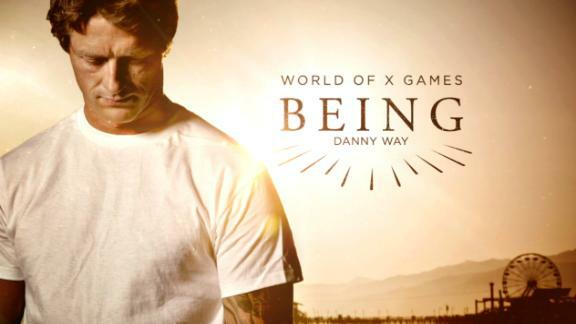 "X Games is all the same people I race with every weekend," he says. "It's just another race with a different name." Hometown crowds were cheering for Aspen native Alex Ferreira, who secured his second-in-a-row bronze medal in men's Ski SuperPipe. Ferreira is one of the few skiers in the field who can throw a down-the-pipe double flatspin. The women of snowboard slopestyle stepped up the jump-line tricks in the finals on Sunday morning at X Games Aspen, with Spencer O'Brien landing a backside 900 and Enni Rukajärvi almost landing a Cab 900 on the final booter. 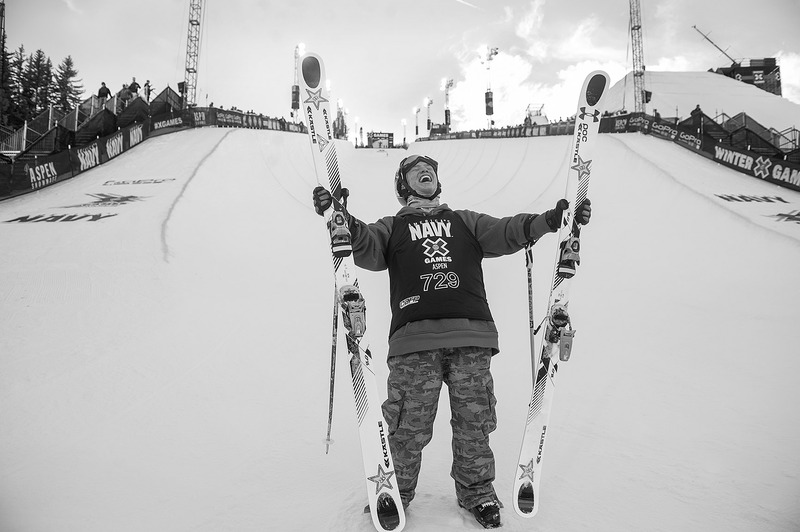 At 14 years old, Chloe Kim became the youngest athlete ever to win a gold medal at X Games Aspen. 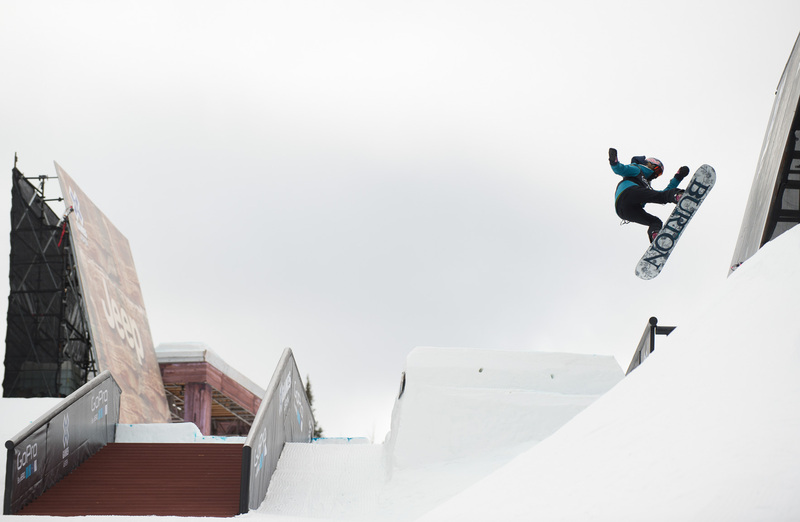 Her winning run included two highly difficult switch tricks: a switch backside air and a switch backside 720, which she threw after casing the coping in practice, scraping her face and chipping her tooth in the process. Jason Fox, shown here, finished in fourth in the return of HillCross at X Games Aspen. 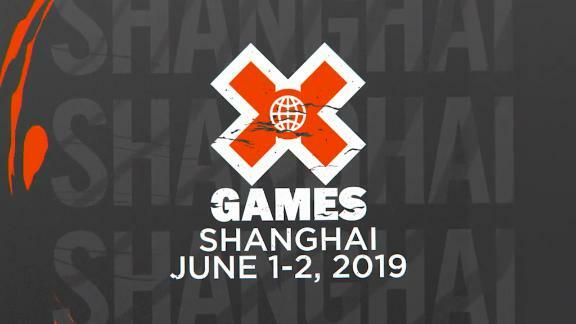 Canadian Ryan Simons led in all of his qualifiers and eventually ran away with his first X Games gold medal, while Justin Thomas and Nathan Titus ended up with silver and bronze, respectively. Clark has been dominating competitive snowboarding for 15 years -- or since before Chloe Kim was born. The most decorated athlete in X Games history, Clark has 70 career wins in the halfpipe, and before Saturday night her past five consecutive X Games medals were gold. She's still the only woman throwing 1080s in her contest run, and her silver-medal run not only broke a height record, it included a beautiful tuck-knee and crippler stalefish, setting the bar for women's snowboarding, once again. 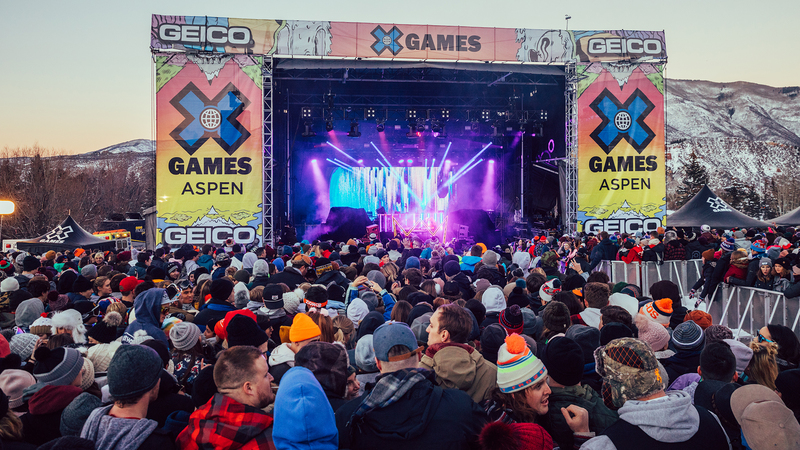 The concerts at X Games Aspen continued on Saturday with dance-music duo Chromeo in the afternoon and womp DJ/producer Skrillex, who closed out the night with chest thumping bass drops. Crowd enthusiasm, needless to say, was at an all-time high. Joss Christensen is the 2014 Olympic gold medalist in slopestyle, but in his three previous XG Slopestyle appearances, he didn't crack the top five. That all changed on Saturday, when he took home a silver medal. 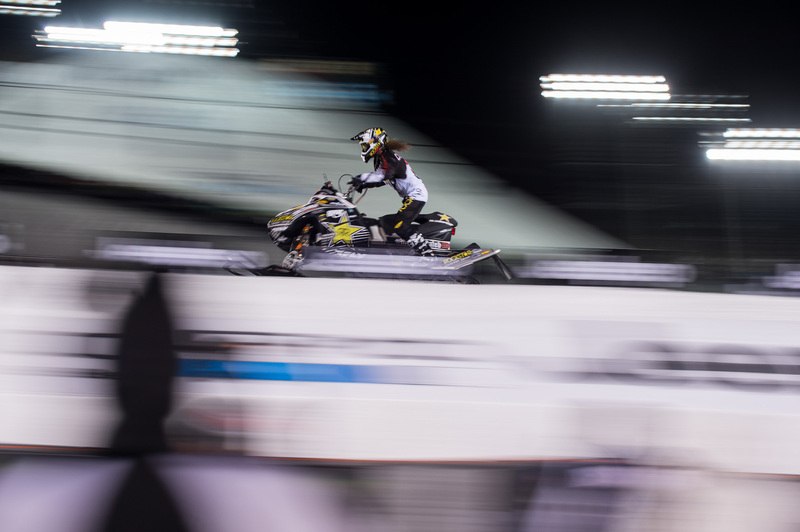 Snowmobile HillCross returned to X Games on Saturday after a more than 10-year hiatus. The last HillCross gold medalist, from 2004, Levi LaVallee, had to pull out of the contest after bruising both his heels coming up short in Snowmobile Long Jump on Friday night. "That was an amazing event," LaVallee said from the TV commentary booth. "It was everything I thought it would be and more." Devin Logan, who won silver at the Olympics last year, came in fourth in women's Ski Slopestyle at X Games Aspen 2015. 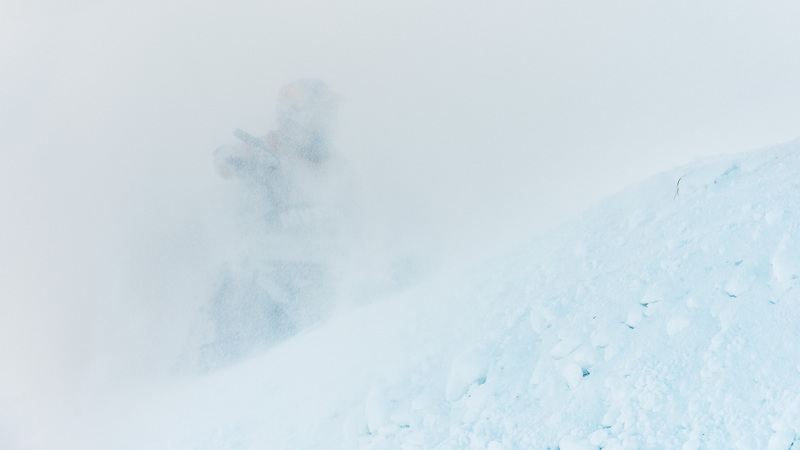 "Psyched on my fourth place at X Games," she posted online afterward. "Love coming down to a bunch of support from the fans." 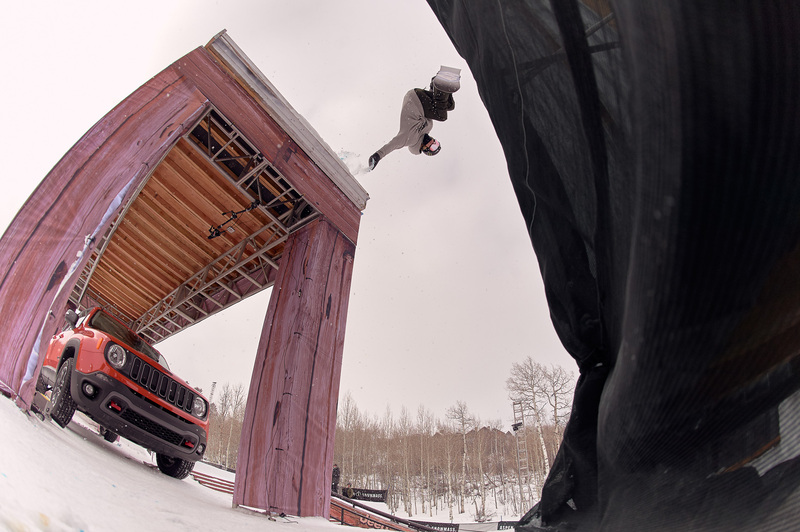 Per tradition at XGames.com, we will be bringing you the best imagery from each day of X Games Aspen 2015 in this rolling gallery. Check back regularly for new photos as we will be adding images as the event unfolds. Pictured here: Everyone knows Gus Kenworthy as a slopestyle skier because of his Olympic silver medal in the discipline's debut at Sochi. 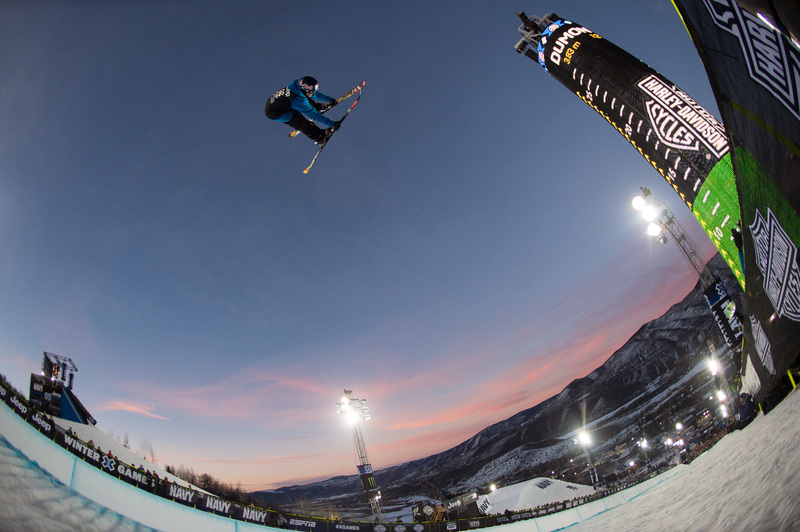 He qualified for the SuperPipe finals in first place on Friday night ahead of favorite David Wise. "I've tried to pace myself," Kenworthy said about competing in multiple events. "I'm certainly surprised to end up on top." If his performance keeps up, he just might be the first skier to medal in both slope and pipe at X. 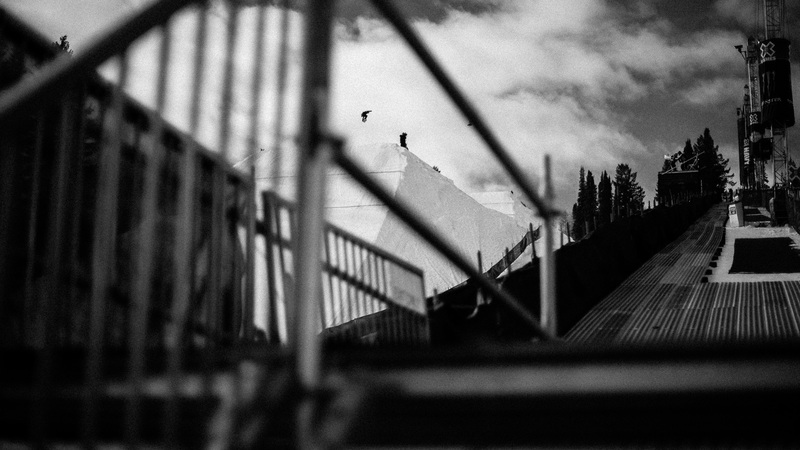 Per tradition at XGames.com, we will be bringing you the best imagery from each day of X Games Aspen 2015 in this rolling gallery. Check back regularly for new photos as we will be adding images as the event unfolds. Pictured here: Everyone knows Gus Kenworthy as a slopestyle skier because of his Olympic silver medal in the discipline's debut at Sochi. 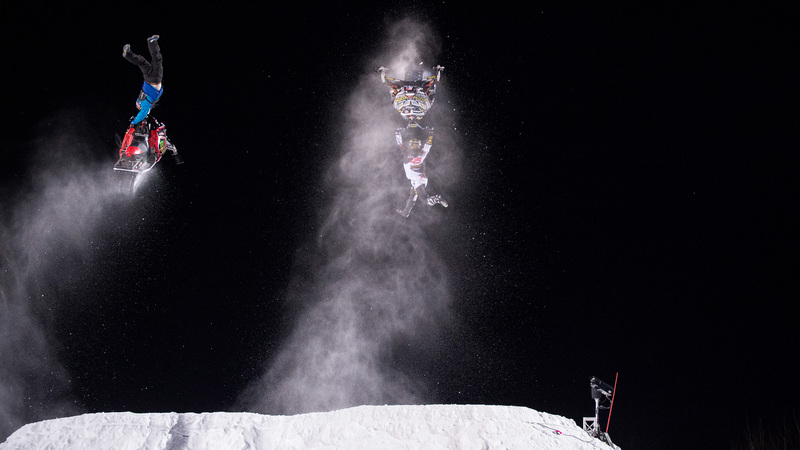 He qualified for the SuperPipe finals in first place on Friday night ahead of favorite David Wise. "I've tried to pace myself," Kenworthy said about competing in multiple events. "I'm certainly surprised to end up on top." If his performance keeps up, he just might be the first skier to medal in both slope and pipe at X. 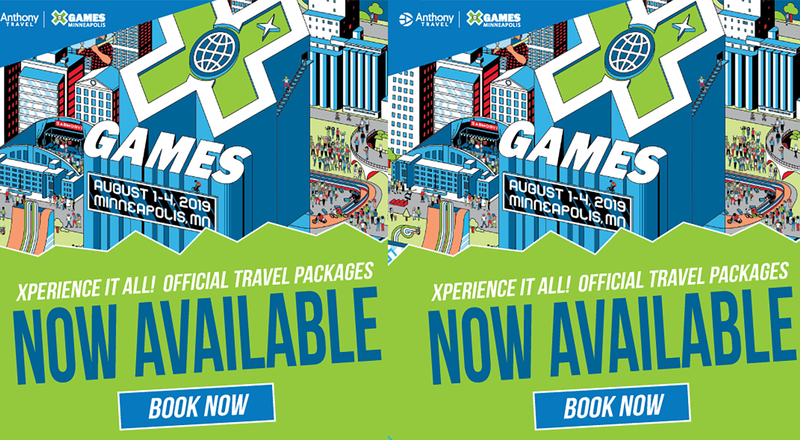 The snowboard world held its collective breath at X Games Aspen 2014 when the Olympic slopestyle favorite Mark McMorris clipped a rail in the X Games final and broke a rib, putting his Olympic bid in question and handing Max Parrot X Games gold. McMorris made it clear Friday that he's back with a vengeance when he qualified for Slopestyle Elims in first place in the morning, then came back in the evening and won Big Air gold with a backside triple cork 1620. 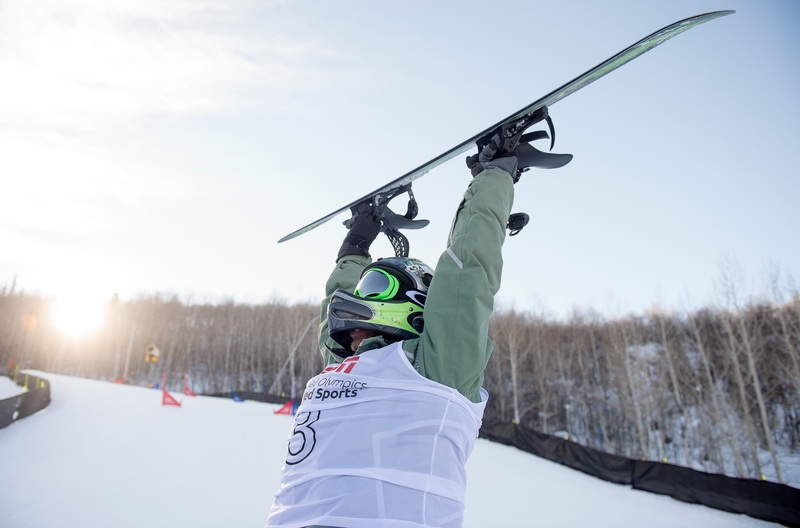 Canadian Alex Massie of Barrie, Ontario, celebrates wins his first X Games medal, a bronze, in Adaptive Snowboarder X on Friday. Massie, 19, is a below-the-knee amputee. 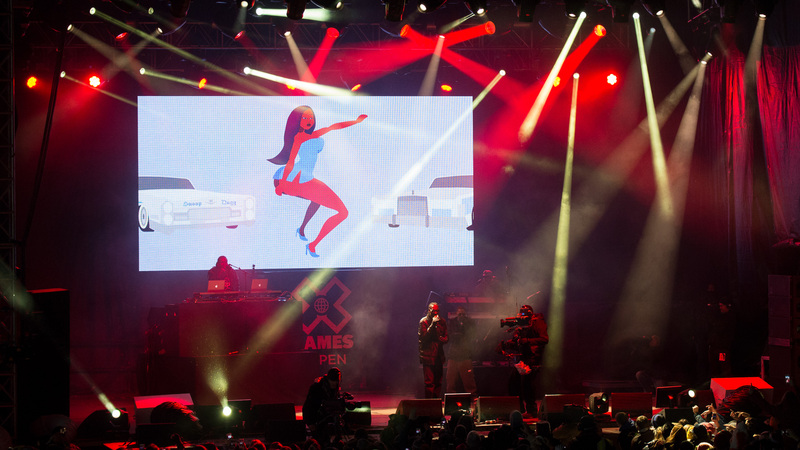 Hip-hop superstar Snoop Dogg kicked off a weekend of music at X Games Aspen on Friday with a rapid-fire medley of hits performed for a sold-out crowd at the base of Buttermilk Mountain. 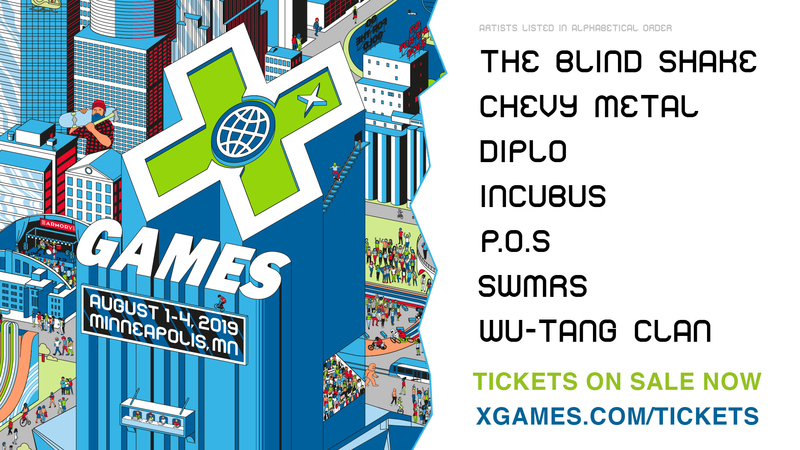 Chromeo and Skrillex will bring the electronic vibe on Saturday, and Wiz Khalifa will end the weekend on Sunday. 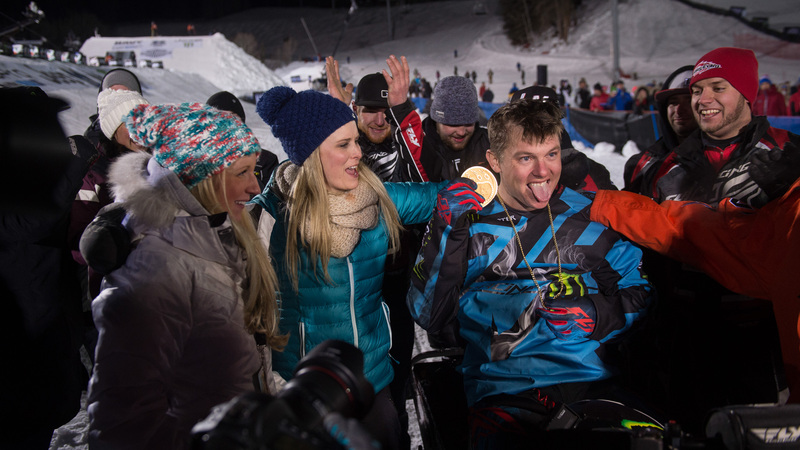 Heath Frisby had something to celebrate on Friday night: He launched his snowmobile a whopping 164 feet, 11 inches to win his 10th X Games gold medal, edging out silver medalist Cory Davis and bronze medalist Colten Moore in Snowmobile Long Jump. Olympic Slopestyle gold medalist Sage Kotsenburg didn't qualify in the top spot in Friday's Slopestyle Elims -- that honor went to Mark McMorris -- but he sure made snowboarding look fun with tricks such as this cork 900 double nose grab. Colten Moore is on a roll. Just one night after winning gold in Snowmobile Speed & Style, Moore added to his medal count by snagging a bronze in Snowmobile Long Jump. 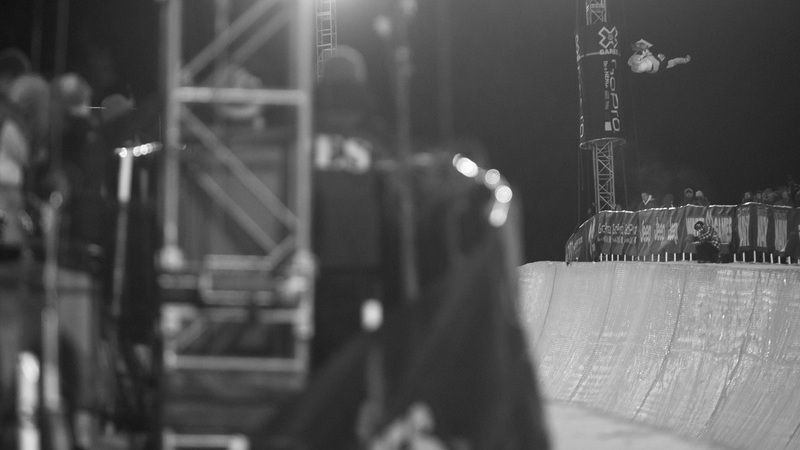 Seb Toutant came into the X Games with a severe flu and spent the week leading into Friday's Slopestyle Elims in bed. The illness wasn't evident when he stomped his run, however, and easily qualified for Sunday's final. Though he was definitely talented enough to make the Norwegian Olympic snowboard team, Aleksander Oestreng declined to try to make the team due to disagreements with the qualification process and the FIS governance of snowboarding in general. Unfortunately, he didn't make it out of Slopestyle Elims on Friday. It wasn't for lack of trying, however. Ten-time X Games medalist Simon Dumont might have completed his career's final competition run through the halfpipe. 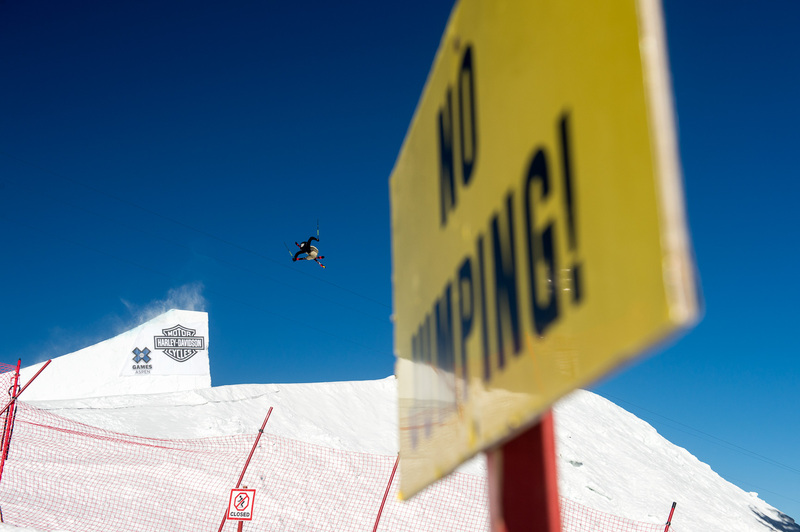 Dumont competed with an injured hand in Ski SuperPipe eliminations and didn't advance to the finals. 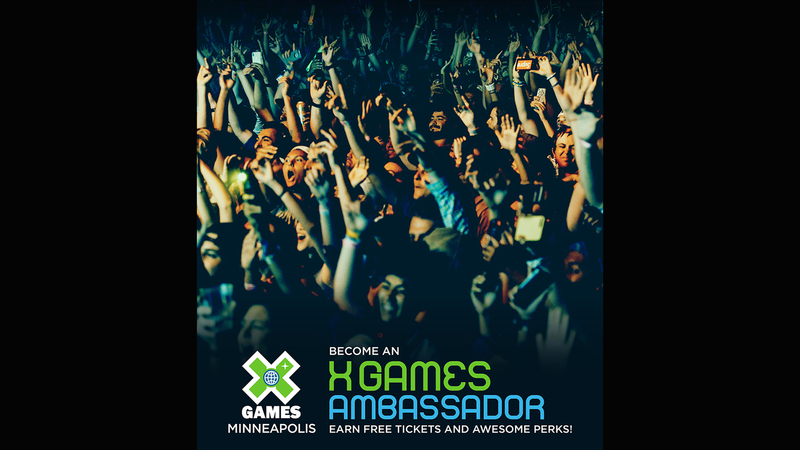 "X Games has always been great to me, so I figured if you're going to end it, this is the spot," he said. Rolling terrain sets the high-speed flow of the Snowboarder X course, seen here through the window of a snowcat. Not only did Chris Devlin-Young win the gold medal in Mono Skier X on Thursday, but at the age of 53 years, 3 weeks, he also broke a record that has stood since 1996: oldest medalist in XG history. 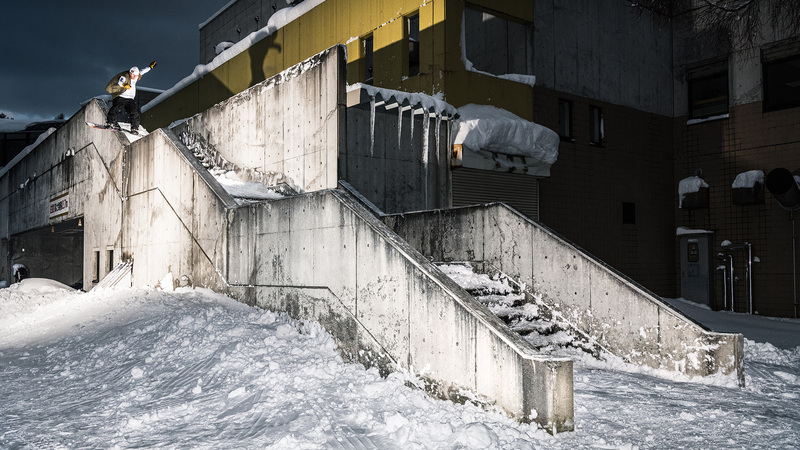 Danny Davis trained for the X Games by taking a powder shred trip to Japan with Mark McMorris and Terje Haakonsen. 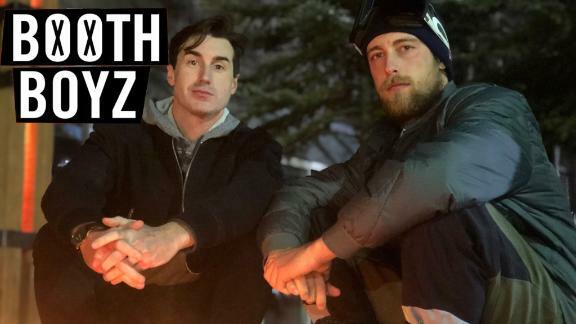 The fact that he claims he "hasn't ridden pipe much" this season didn't seem to be a factor as the 2014 X Games Aspen SuperPipe gold medalist handily won his second gold on the last run of the night on Thursday, effectively bumping Shaun White off the podium in the process. Ten Special Olympics snowboarders got a chance to ride at X Games on Thursday during a first-of-its-kind dual slalom team event on Buttermilk's X course. The Special Olympics athletes competed head-to-head on the course, followed by 10 celebrity athletes, led by Special Olympics global ambassador Hannah Teter. The event felt less like a competition than a celebration of snowboarding among friends. 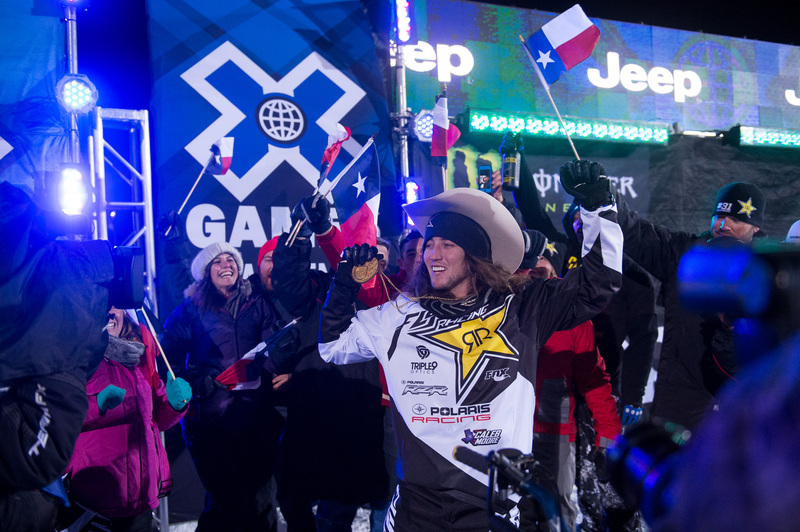 Colten Moore knows what it's like to win gold at X Games: He has two Snowmobile Freestyle victories from 2012 and 2014. But this year was his first time entering the Snowmobile Speed & Style event, which combines the freestyle maneuvers he's used to with fast-paced racing that he's less accustomed to. Moore went up against veteran Joe Parsons in the final round and ended up with the gold. "To come back and get another gold, especially racing against all these guys who've been doing this forever, I'm impressed with myself actually to stay somewhat close to these guys," said Speed & Style gold medalist Colten Moore, who lost his brother, Caleb, in a snowmobile accident at X Games two years ago. "I'm just pumped to give this to Caleb again." X Games rookie Jesper Tjäder from Sweden might not have qualified for finals in Ski Slopestyle at X Games 2015 (he finished 11th in Thursday's slope eliminations), but the 20-year-old up-and-comer has one more shot at X Games stardom: He'll also be competing in Ski Big Air on Saturday night. "You're trying to tell your body, 'It's OK to go upside down on this 500-pound machine. This is a good idea.' Your body is going, 'You're kidding me, man.' You're constantly in this battle," said seven-time X Games gold medalist Levi LaVallee, shown here during practice for Snowmobile Speed & Style. 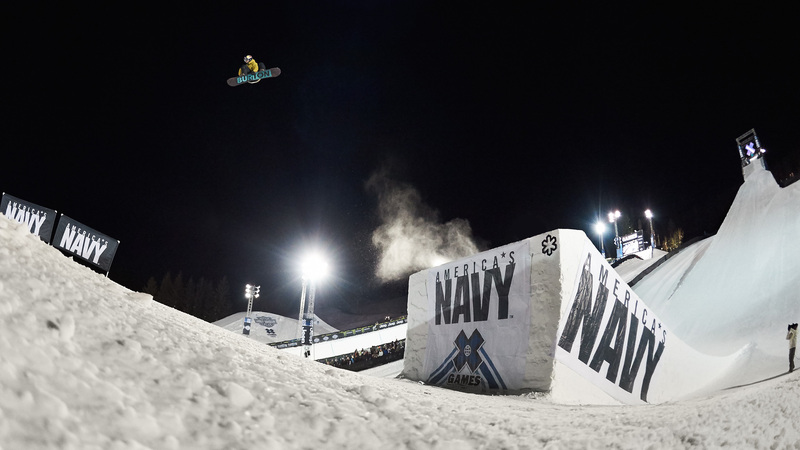 The women of Ski SuperPipe started off X Games Aspen with a bang Wednesday night. 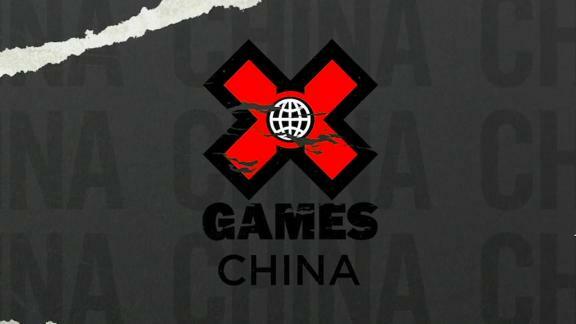 Maddie Bowman secured her third X Games gold in a row, while Ayana Onozuka took silver and became the first female Japanese skier to win an X Games medal. Brita Sigourney, pictured here, took bronze, her first XG medal since 2012. 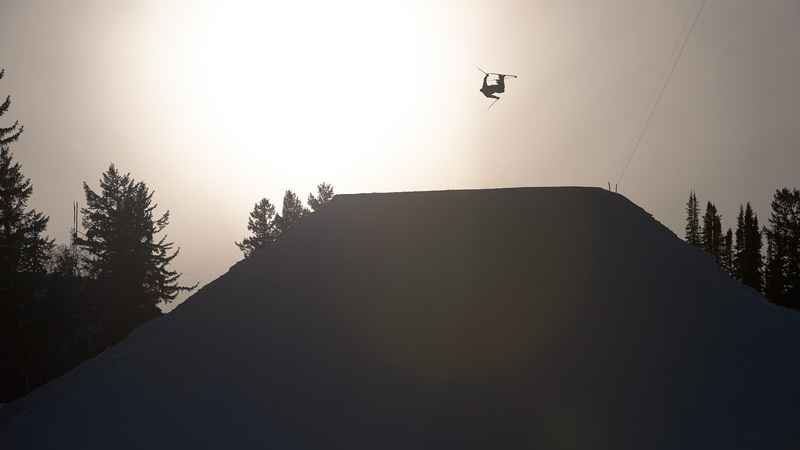 Men's Snowboard Slopestyle finals take place Sunday, but during practice earlier in the week, Sage Kotsenburg was hard at work on rumored new tricks. Kotsenburg won gold at slopestyle's Olympic debut in Sochi, Russia, last winter, but he's yet to win gold here in Aspen. Here he is with a handplant gap to wallride, in keeping with his strategy to keep his tricks as interesting and fun-looking as possible. 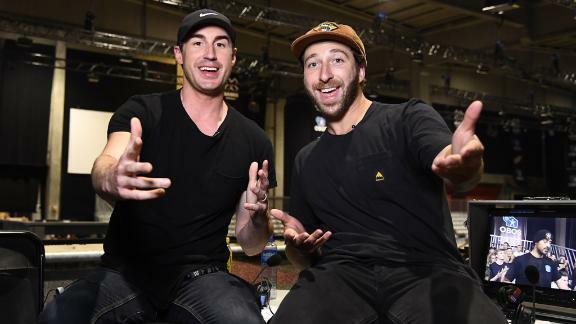 Trevor Jacob will be competing in Snowboarder X Friday morning in Aspen, but you might recognize his name from Travis Pastrana's touring action sports show, Nitro Circus, where Jacob has been a regular performer. Jacob's also a surfer, skateboarder and BMXer, but in recent years, he's decided to focus on snowboarding. "I thought all the sports were so cool," Jacob said. "But when I got into snowboarding, the rest fell off." American Nick Goepper would have been going for a three-peat in men's Ski Slopestyle, but instead, he failed to make the cut to advance out of elims on Thursday. From Olympic gold medalist Joss Christensen to former gold medalists Bobby Brown and a healthy Tom Wallisch, the field is stacked with heavy hitters. 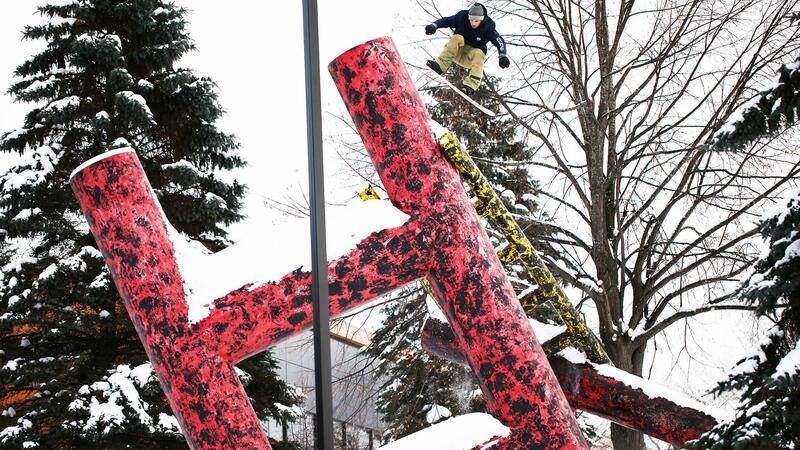 Men's Ski Slopestyle finals goes down on Saturday. Jamie Anderson is the most decorated rider in the women's Snowboard Slopestyle field. Not only did she win the inaugural slopestyle event at the 2014 Winter Olympics, she also has nine X Games medals, one from each of her Slopestyle appearances. 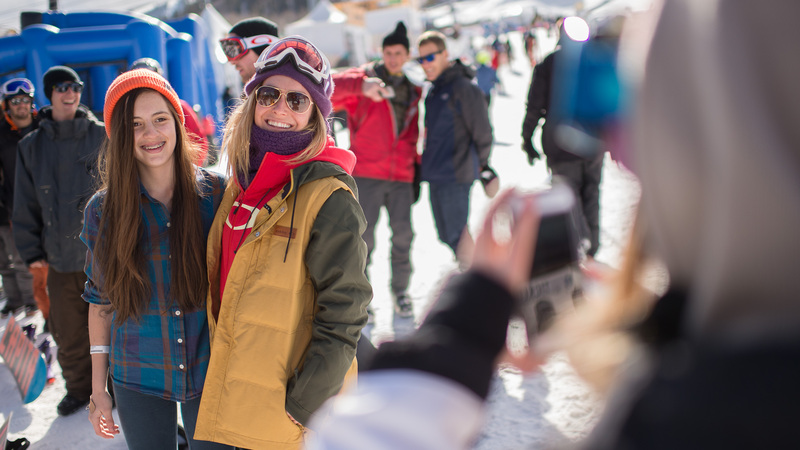 Here, Anderson takes time out to hang out with fans at the base of Buttermilk mountain during her "Instameet." 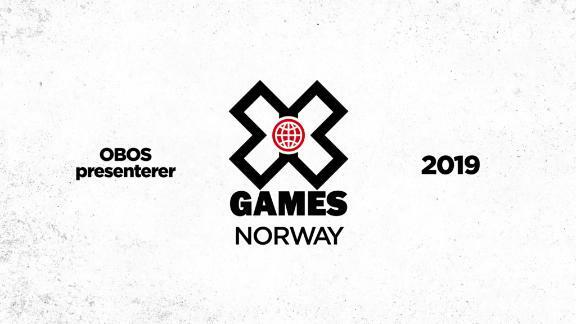 American McRae Williams earned a silver medal in Ski Slopestyle at X Games Aspen last year and in 2013, he won Slopestyle gold at X Games Tignes in France. But this time around, things didn't go his way. 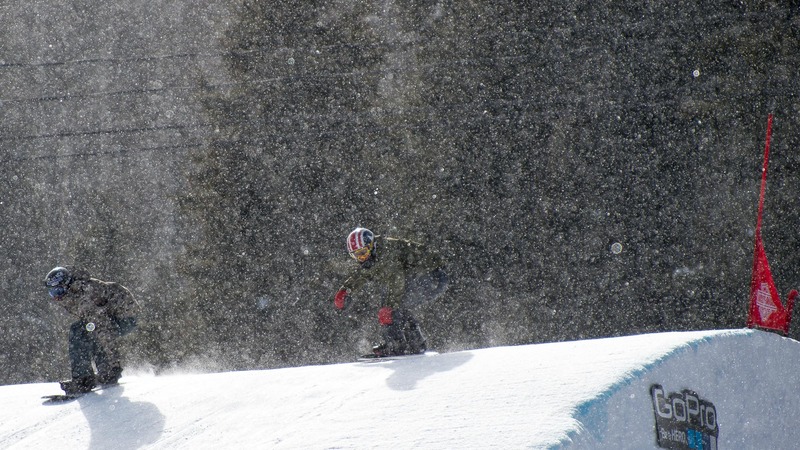 He just missed qualifying for Slopestyle finals among a highly competitive field. "Skied my best today ... Guess I have some work to do," Williams tweeted afterward.